Back in Jogja for another month of Bahasa Indonesia tuition. Déjà vu sekali! 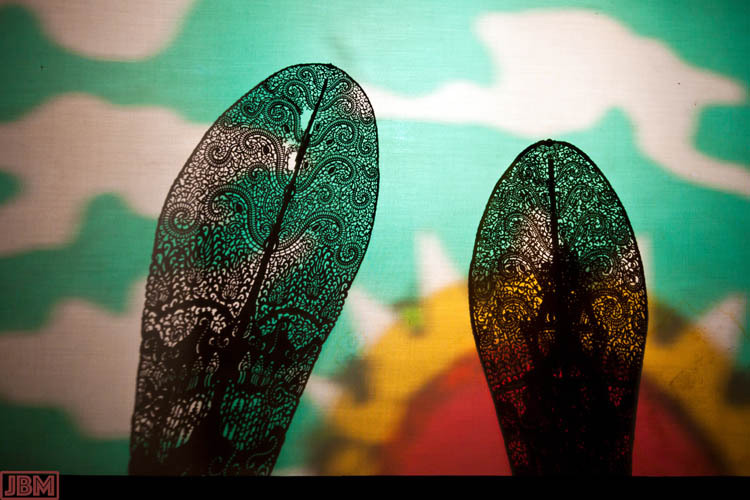 Over the years, we’ve attended several performances of that most Javanese of artforms, the wayang kulit, or shadow play. (A closely related form of wayang kulit is also found in Bali – as in the photo above). 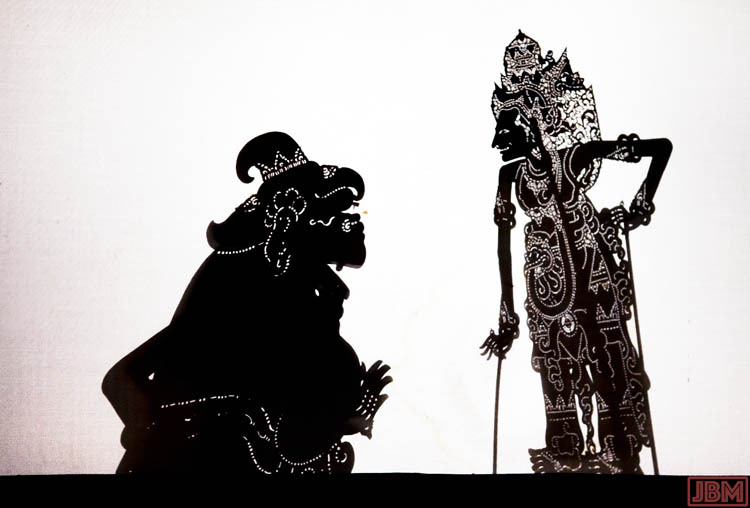 In the wayang kulit performance, a master puppeteer (Dalang) sits behind an illuminated cloth screen (kelir), and tells stories using the shadows cast by the large number of two-dimensional, semi-articulated puppets that he has arrayed in front of him. The stories told are mostly derived from the Ramayana and the Mahabharata, with many characters and narratives added to the Indonesian versions of these classic Hindu epics. There is drama and pathos, good vs evil, romance – and a large amount of broad rollicking humour, with the Dalang adding in references to contemporary events. The Dalang is supported by a gamelan orchestra, and the performance, which will go for many hours without a break, is bound to contain something of appeal to every member of the audience. Audience members, sitting in front of the screen, greet the appearance of each new character with gasps, hoots of delight, sighs etc as appropriate. They recognise the shapes, and they know the names and personalities of every one of the dozens of characters, and their place within the overall narrative. Some of the characters are perennial audience favourites, such as the powerful Bima and the comical Panakawan servants, led by the god/clown Semar. The stories can be a bit opaque to the foreign viewer, as they are told in the Javanese (or Balinese) languages. 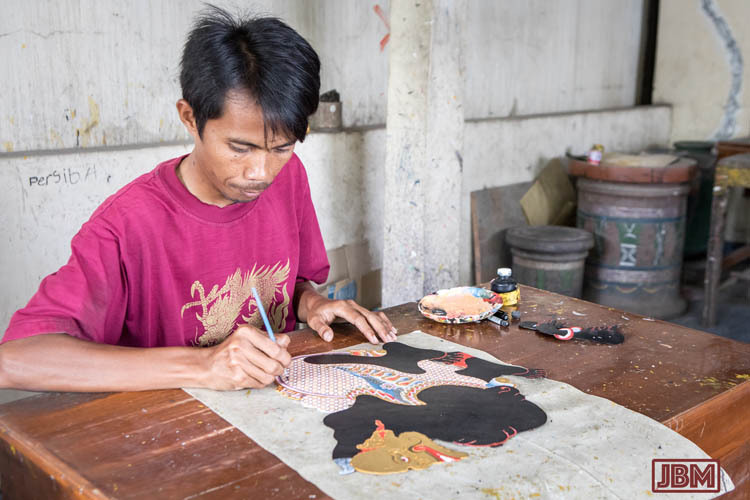 We have enjoyed watching the wayang kulit shadow puppet performances, but until our recent visit to the village of Gendeng (just south of Jogjakarta) we hadn’t realised just how much effort, time skill and creative art goes into making the flat puppets themselves. 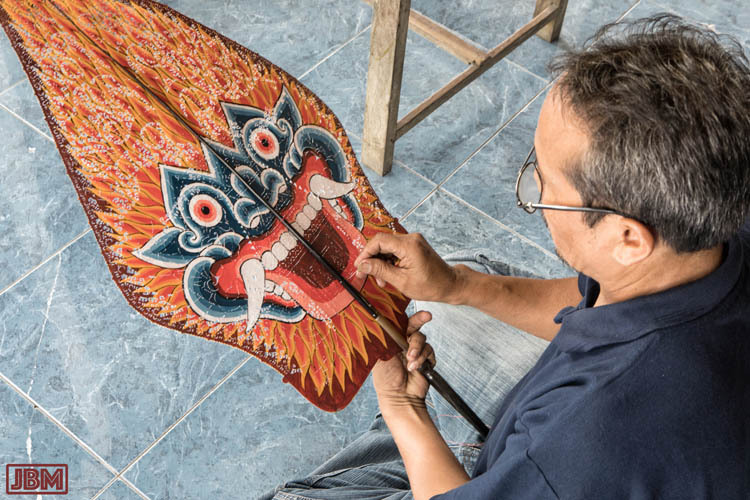 As with most of the ‘traditional’ material arts of Indonesia, there is no meaningful boundary drawn between craft and art, or between the skills of creation and construction, as is (erroneously, IMHO!) applied in the West. 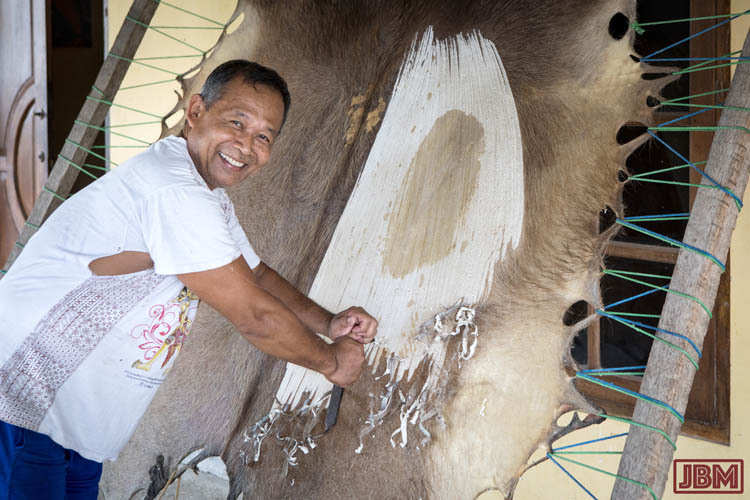 The workflow begins with a whole skin from a water buffalo (kulit kerbau). 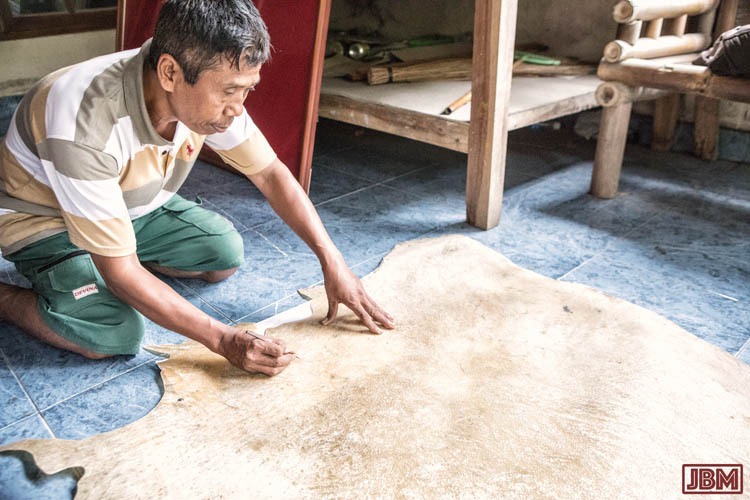 Buffalo skins are stronger and more even in thickness than those from cattle. The best ones are imported from the region of Toraja in South Sulawesi. The skin is soaked, cleansed and cured (sometimes for years) in preparation for making the puppets. By this stage it is clean, stiff and translucent. 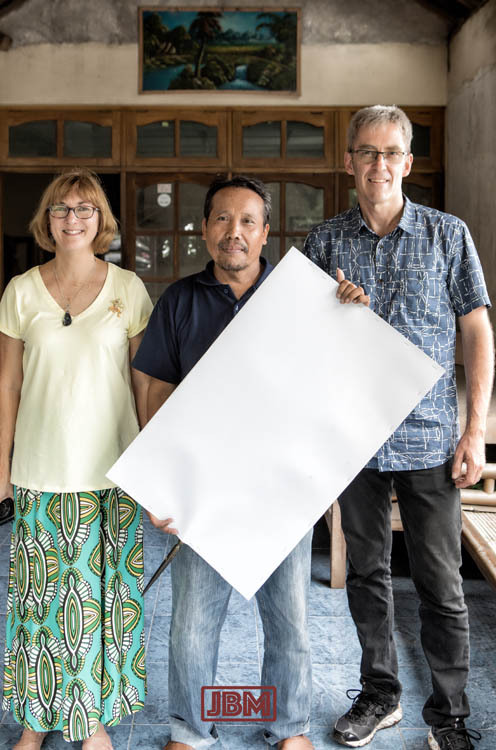 Pak Daldek prepares a full size drawing of the puppet to be created drawn onto paper (or, in this instance, a photocopy of a drawing! ), and places it below the (now-translucent) sheet of buffalo hide. 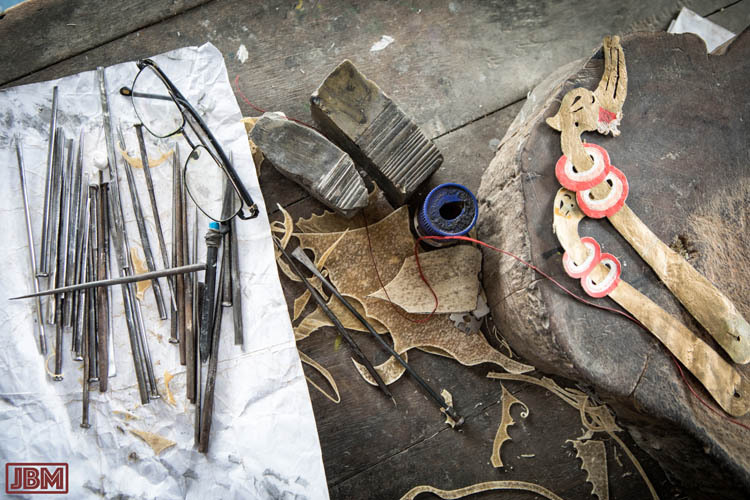 Working on the floor, Pak Daldek uses a set of variously-sized hole punches (mostly shaped like heavy duty nails) and cutting blades to cut out the main features of the puppet design. Transferred to a workbench, the details of faces, body, and the articulated limbs are carefully added to the puppet until complete. The precise design of each character (angles, lines, placement of holes) is codified, and must be memorised and carefully applied by the maker. At another bench, the specialist painter or pelukis wayang (Pak Parjio) applies water-based inks by brush. The pigments are water-based, and are (or were?) all traditionally derived from natural materials – lampblack, blue from indigo, white from burnt bones, yellow from ochre and red from cinnabar – all fixed in a medium of egg-white. Commercial pigments may be used nowadays. In the better quality puppets, gold is applied not by ink but as gold leaf. Some of the complicated patterns which are painted on include really finicky details. 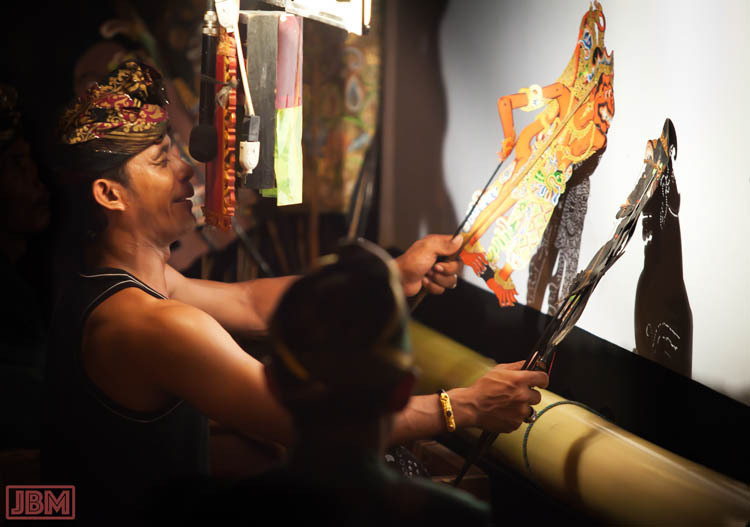 Pak Suprih is the master puppet-maker (Empul Wayang in Bahasa Java) and owner of the workshop the we visited. He began making wayang kulit in 1974, and studied as an apprentice with two other masters of the art/craft – Ba Pudjo and Pak Sagio. 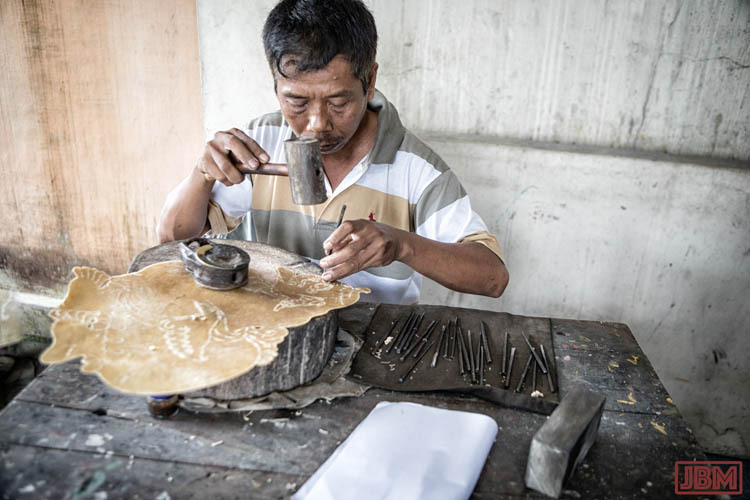 In the photo above, he is attaching the finished kulit to a finely turned and split length of buffalo horn, which is used by the Dalang as a handle during performances. 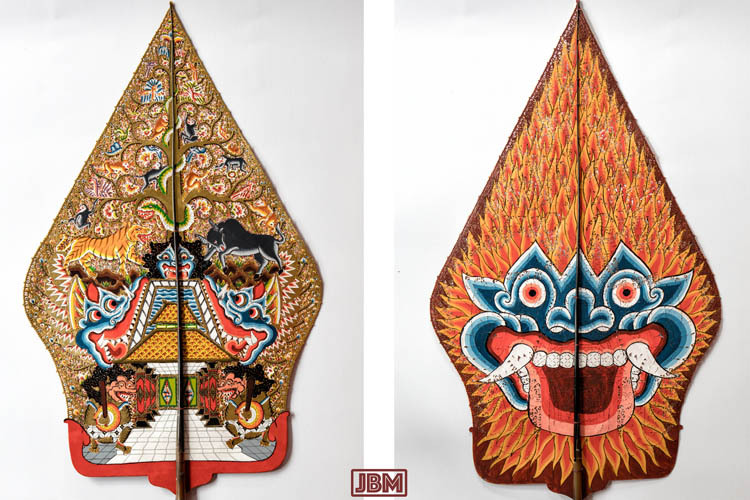 Above are front and back views of a finished Gunungan shadow puppet (which we bought from Pak Suprih…). The Gunungan (‘Mountain’) or Kayon (‘Forest’) is a special puppet – indeed the most important one of the entire wayang performance. 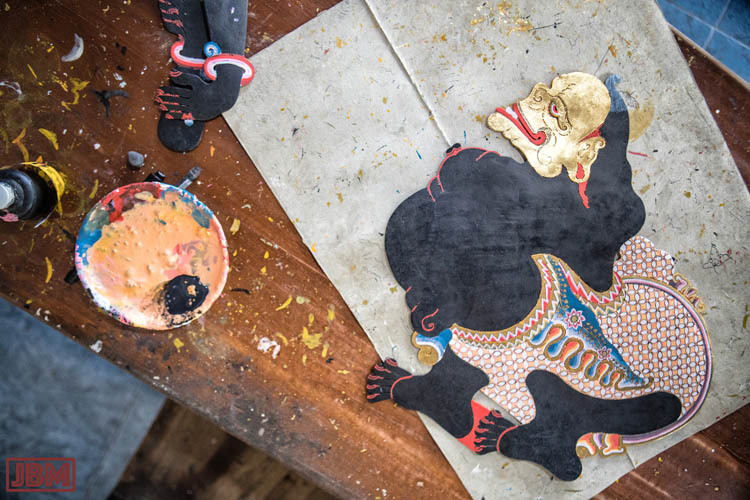 It is the first and last puppet used by the Dalang, and it is also is employed during performances to indicate major natural destructive forces like fires and storms. A second, ‘female’ Gunungan is also used in wayang kulit – the one above is the (slightly smaller) ‘male’ Gunungan. On its front side it features a tree of life (a banyan tree in gold leaf), with monkeys, birds and other animals in its branches. In the middle is the blue face of the demon Kala (‘Time’). There are two doors below, at the top of stairs guarded by monstrous guardians, which lead to heaven. In total the puppet represents the totality of heaven and earth, and all living and/or sentient forms of existence. The reverse side shows symbols for fire, water and air. It is dominated by the face of the demon Kala – representing time, or the forces of destruction in the universe. This entry was posted in Indonesia and tagged Dalang, Desa Gendeng, Gunungan, Java, Jogjakarta, Kayon, Pak Suprih, wayang kulit. Bookmark the permalink.